A Double Chin is a regular condition caused by weight gain that results into fat cells forming a layer under the chin. It is also called submental fat. Genetics or aging may also cause a double chin. What are the other types of double chin treatments? Control diets and exercise are not enough in treating a double chin. It takes a considerable weight loss to notice any result around the chin. However, other non-surgical treatments that can help you to contour your jawline and help you to regain your face shape. These are Kybella, Ultherapy, Coolsculpting, etc. 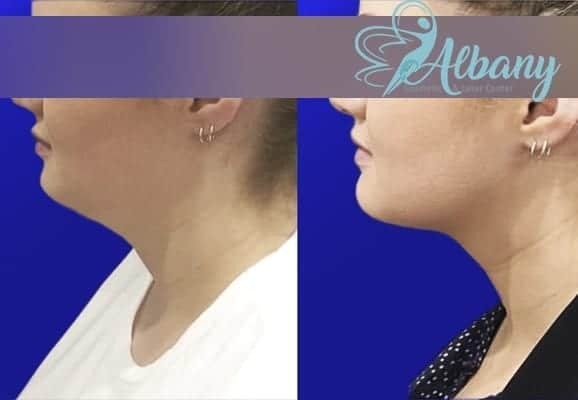 Kybella is a non-surgical injectable technique used for the reduction of fat on the upper neck, also known as the double chin. It is a treatment used to get rid of fat around the neck. It is a formulation of deoxycholic acid that helps in the absorption and breakdown of fat (liposuction). Kybella is approved by the FDA as an injectable treatment for the appearance of a double chin. Deoxycholic acid is a naturally occurring substance in the body which helps in the absorption of dietary fat. It is a bile acid found in the liver and works to dissolve fat cells. Once it is injected into the targeted area (beneath the chin), the acid breaks down, absorb and prevent further storage of fat in that area. Kybella injections should be administered by a healthcare professional because the deoxycholic acid can also kill other cells. How many Kybella’s injections are required? The number of treatment sessions required depends on individuals. But generally speaking, multiple sessions (2 to 5 sessions) might be required for effective treatments. Each session is about 15-20 injections, and the session needs to be properly spaced out, about the one-month interval between each session. What are the risks and side effects involved? within one to two weeks after treatment. Some common post-treatment discomfort or side effects may include bruise, redness, swelling, pain, and numbness. Severe side effects may include an uneven smile, may have a problem swallowing, facial muscle weakness and sometimes injury to the nerves. Report immediately any sign of severe side effects you experienced with your healthcare provider. What to expect after Kybella? Most people after receiving two to four sessions of Kybella’s treatment achieved noticeable results. The result is lasting, and no further treatment is required because the deoxycholic acid destroys the fat cells and they can no longer store fats. How about the cost of Kybella? The cost of Kybella depends on the number of treatments required, the charging fee of your healthcare provider and sometimes your geographical location. But on the average, the cost of Kybella is between $1,200 and $1,800. Kybella is not covered by medical insurance as it is considered to be a cosmetic formula. energy delivered to the dermal and deep layers of the skin to lift and tighten skin on the neck, eyebrow and under the chin. The natural body healing process aids Ultherapy. technology to lift and to tighten without the need for surgery. No downtime needed – As a result of its non-invasive nature, Ultherapy requires no downtime. Long lasting results – It takes two to three months to notice any effective results. The result improves over time, and they are long-lasting. Adjustable treatment – The depth of the energy and the length of treatment can be adjusted to the individual’s needs. Natural look enhancement – Ultherapy causes gradual tightening of the skin through collagen stimulation by the natural regenerative process, resulting in a very natural look. Without the risk and healing process of surgery, you can have an anti-aging result. to touch for a brief period. These effects are mild and temporary in nature. resist all effort made through diet and exercise. It is the only FDA-cleared, non-surgical fat-reduction treatment. The coolsculpting procedure cools and crystalized targeted fat cells under the skin and the body naturally eliminates the dead cells. Coolsculpting treats larger span of fats underneath the skin than any other non-surgical treatments. people can engage in other activities like reading a book or taking a nap. There’s no downtime and recovery required. One can return to normal activities after treatment. Coolsculpting is a fat freezing technology approved by the FDA. There is no artificial substance involved in the process. It’s a controlled cooling that targets only fat cells. The way you feel about your appearance is reflected in the way carry yourself. The treatment makes you look great, thereby boosting your confidence. It enhances a natural looking and long lasting results.